Chikamatsu Monzaemon statue in Chikamatsu Park, Amagasaki City, Hyogo Prefecture, Japan. Chikamatsu Monzaemon (Japanese: 近松門左衛門; real name Sugimori Nobumori, 杉森信盛) (1653 – 1725) was a Japanese dramatist of jōruri, the form of puppet theater that later came to be known as bunraku, and the live-actor drama, kabuki. Chikamatsu is considered the Japanese “Shakespeare” for his assortment of plays staged by puppets in the early era of bunraku stage plays. He wrote both historical romances (jidaimono) and domestic tragedies of love and duty (sewamono). Over one hundred ten joruri (puppet plays) and thirty kabuki plays are attributed to Chikamatsu, and he had a profound influence on the development of the modern Japanese theater. He was the first author to create plays that not only showed off the skill of the puppet operator, but had literary merit of their own. Chikmatsu wrote plays mainly for theaters in Kyoto and Osaka, most of them notable for their double-suicides. His most famous works include the Kokusenya-kassen (Battle of Coxinga), a historical drama about the conquests of a famous Chinese warlord, and the romantic tragedy Shinju Ten no Amizima (The Love Suicides at Amizima). Chikamatsu was born "Sugimori Nobumori" to a samurai family in 1653. His birthplace is disputed; the most likely theory says that he was born in Echizen province, but other candidates include Hagi, in Nagato province. His father, Sugimori Nobuyoshi, served the daimyo (feudal lord) Matsudaira, in Echizen, as a medical doctor. Chikamatsu's younger brother also became a medical doctor and Chikamatsu himself wrote a book about health care. In those days, doctors who served daimyo held samurai status. His father lost his office and became a ronin, abandoning his feudal duties sometime between 1664 and 1670. During his teens, Chikamatsu moved with his father to Kyoto, where he served for a few years as a page for a noble family and court aristocracy. Otherwise, this period of Chikamatsu's life is obscure; he published his first known literary work in this period, a haiku published in 1671. After serving as a page, he next appeared in records of the Chikamatsu Temple (long suggested as the origin of his stage name "Chikamatsu") in Omi Province. In 1683, his puppet play on the Soga brothers (The Soga Successors or "The Soga Heir"; Yotsugi Soga) was first performed in Kyoto, and Chikamatsu became known as a playwright; The Soga Successors is believed to have been Chikamatsu's first play, although fifteen earlier anonymous plays are sometimes attributed to Chikamatsu as well. Chikamatsu also wrote plays for the kabuki theatre between 1684 and 1695, most of which were intended to be performed by a famous actor of the day, Sakata Tōjūrō (1647- 1709). From 1695 until 1705, almost everything Chikamatsu wrote was a kabuki play, and then he abruptly abandoned that media almost completely. The exact reason is unknown; perhaps the puppets were more biddable and controllable than ambitious kabuki actors, or Chikamatsu did not want to continue writing for kabuki when Tōjūrō was about to retire; or perhaps the growing popularity of the puppet theater was economically attractive. In 1705, Chikamatsu became a "Staff Playwright" as announced by early editions of The Mirror of Craftsmen of the Emperor Yōmei. In 1706, Chikamatsu left Kyoto for Osaka, where the puppet theater was even more popular. Chikamatsu's popularity peaked with his plays about love-suicides, and with the blockbuster success of The Battles of Coxinga in 1715. Thereafter the tastes of patrons turned to more sensational gore-fests and crude antics; Chikamatsu's plays fell into disuse and the music for many of his plays was lost. Chikamatsu was the first known Japanese playwright who did not also act in the pieces he wrote. It is thought that Chikamatsu wrote a total of around one hundred thirty plays. In Japanese literature and music, joruri is a type of chanted recitative; often the script for a bunraku puppet drama, performed by a tayu (chanter) accompanied by a musician. At first joruri was accompanied by a four-string biwa (Japanese lute); after the introduction of the three-stringed, plucked samisen (or shamisen) from the Ryukyu Islands in the sixteenth century, both the music and the scripts developed. When puppets were added at the end of the sixteenth century, the joruri took on a new dramatic quality, depicting themes such as loyalty, vengeance, filial piety, love, and religious miracles and placing more emphasis on dialogue and descriptive commentary. The chanter, or tayu, had more authority than the writer of the script, until the appearance of Chikamatsu Monzaemon, in the late seventeenth century. A thirty-year collaboration between Chikamatsu and the tayu Takemoto Gidayu (1651–1714) raised the puppet theatre to a high art. Gidayu himself became so famous that his style, gidayu-bushi (“Gidayu music”), became nearly synonymous with joruri. Takemoto Gidayu was born Shimizu Gorobei (or Shimizu Ritayu) in Setsu (now Osaka) as a farmer’s son. He had a beautiful theater voice, which was said to sound “like spikes or cramps being hammered into a cutting board.” Even when the house was full, his voice reached the audience in the last row clearly. In 1684, Takemoto Gigayu opened Takemoto Za (theater) at Dotonbori in Osaka. For the opening event, Takemoto Gidayu chose Chikamatsu’s puppet play The Soga Successors ("The Soga Heir"; Yotsugi Soga). The Soga Successors was already playing at the Uji Za (theater) in Kyoto. Takemoto succeeded in Osaka with his performances of Chikamatsu’s plays. In 1685 Uji Za, a rival of Takemoto Za, suddenly was ventured into Osaka. Uji Za had retained the playwright Ihara Saikaku (1642-1693), one of the most brilliant figures of the seventeenth-century revival of Japanese literature. He delighted readers with racy accounts of the amorous and financial affairs of the merchant class and the demimonde. 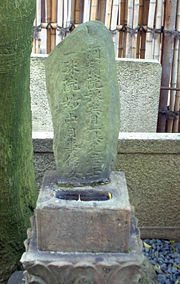 The two years before, Saikaku had written “Koshoku ichidai otoko” (The Life of an Amorous Man) which had gained quite a reputation. Uji Za used Saikaku’s play to challenge Takemoto Za’s performance of a theme play by Chikamatsu, “Calendar.” Takemoto Za was victorious, mainly because of the beautiful voice of Takemoto Gidayu. After Uji Za left Osaka, Chikamatsu wrote an epoch-making work, Kagekiyo Victorious (Shusse kagekiyo 出世景清, 1685). Historically, works written before “Kagekiyo Victorious” were called the old Joruri, and those written after it were called the new Joruri. In writing “Kagekiyo Victorious,” Chikamatsu tried to incorporate the style of Zeami (1363-1443), the greatest playwright and theorist of Japanese Noh theatre. (Zeami and his father, Kan'ami (1333–84), were the creators of Noh drama in its present form.) The famous hero of the tragedy, Kagekiyo, was an actual historical figure, a samurai of the Heike clan from the ancient “Tale of the Heike.” Zeami also wrote about Kagekiyo. In Japan, the period from 1688 to 1704 was characterized by a rapidly expanding commercial economy and the development of a vibrant urban culture in the cities of Kyoto, Osaka, and Edo (Tokyo). During a century of peace under the Tokugawa shogunate, government policy concentrated samurai in castle towns. Edo (Tokyo) served as the administrative capital while Osaka was the country's commercial hub, and rich Osaka merchants were the ones who defined Genroku culture. Free of the rigid codes that restricted samurai, people in the towns had leisure to spend in the pursuit of pleasure, and their wealth created a cultural explosion. With the works of gifted playwrights such as Chikamatsu Monzaemon and Takeda Izumo, the bunraku puppet theater and kabuki developed into a high dramatic art. Ihara Saikaku humorously depicted urban life, while Matsuo Basho perfected haiku poetry. After the deaths of Matsuo Basho and Ihara Saikaku, Chikamatsu monopolized the literary world. In Osaka, Takemoto Za was struggling to compete with other successful entertainments, such as dramatic theatrical shows and performances by windup dolls. A disciple of Takemoto Gidayu named Toyotake Wakatayu, who was popular because of his wonderful voice with beautiful intonations, had opened a rival puppet theater, Toyotake Za. Takemoto Za was determined to re-establish itself, and turned to Chikamatsu for help. Chikamatsu was fifty one years old. At that time a double suicide took place in the forest of Sonezaki, and Takemoto Za asked Chikamatsu to write joruri based upon this incident. “Sonezaki Shinju” (The Love Suicides at Sonezaki, 1703) was written within a fortnight. In the play, an apprentice clerk and his lover, a harlot from the pleasure quarters, finding no other way to be together, decide to commit a double suicide. The play was a great success and Takemoto Za was able to pay off all its debts. This play rekindled Chikamatsu’s career as a writer of joruri. Until this time there had been no domestic tragedies of love and duty (sewamono) in joruri, which specialized in historical stories and legends, especially historical romances (jidaimono). Kabuki had been the domain of love tragedies (sewamono), because it used actual human actors. Chikamatsu now made puppets perform actual events, as kabuki actors did. In 1720, another play by Chikamatsu, The Love Suicides at Amijima (Shinjūten no Amijima 心中天網島), together with performances of “Sonezaki Shinju,” triggered a rash of love suicides. In 1723, the Tokugawa shogunate banned performances of this type of play and decreed that the victims of love suicide would receive no funeral. Chikamatsu was a author of joruri plays in his thirties, kabuki plays in his forties, joruri plays again in his fifties, and in his sixties more mature works, for example, "Kokusenya kassen" ("Battle of Coxinga"), a historical drama, and the domestic tragedy "Shinju Ten no Amizima” ("The Love Suicides at Amizima"). Keene, Donald (translator). Four Major Plays of Chikamatsu, Columbia University Press, 1997. Chikamatsu Monzaemon and Donald H. Shively. The Love Suicide at Amijima: A Study of a Japanese Domestic Tragedy by Chikamatsu Monzaemon. Michigan Classics in Japanese Studies. University of Michigan Press, 1991. Keene, Donald and Mark van Doren. The Battles of Coxinga: Chikamatsu's Puppet Play, Its Background and Importance. Cambridge Oriental Series. Cambridge University Press, 1951. This page was last modified on 11 February 2017, at 15:48.